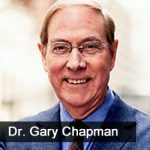 On this 10th episode, Jason Hartman talks to Dr Gary Chapman, author of The Five Love Languages. We each have one of these languages as the paramount way that we feel loved. Understanding our own, and that of our significant others and friends, can improve our relationships more than any other way. Gary Pinkerton opens the episode by explaining how the understanding of love languages helped him understand himself, and his wife, and helped save his marriage.